You want to go to Cuba. Our editors have been to Cuba. And they'll tell you everything you need to know, right here in The Havana Club. If the only thing you know about Cuban food is the country's eponymous sandwich, you don't know anything at all. The streets of Havana aren't paved with ham and cheese baguettes (that's an American invention! ), but rather a food culture driven by a uniquely Cuban streak of resourcefulness in response to scarcity that also characterizes everything from the country’s organic agricultural industry to insane internet habits. To learn more about the fundamentals of eating in Cuba, we spoke at length with Chef Douglas Rodriguez, a Miami-born son of Cuban immigrants who has visited the island ten times since 2013 as a culinary tour guide. Here are the 10 things he thinks everyone should know about the country's cuisine, and if you're traveling to Cuba anytime soon, be sure to visit our Havana Club for more travel tips. What Is Sri Lankan Food? Here Are the 7 Dishes You Need to Know. “Black beans are like Cuban gravy,” said Douglas. A simple stewed version is eaten as a side dish with just about everything. 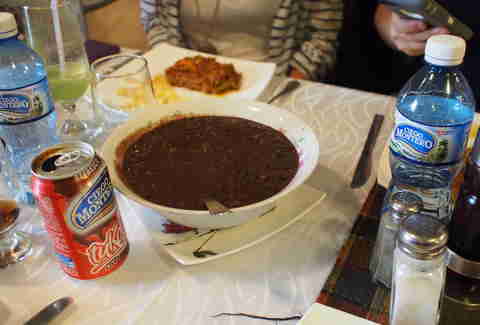 Other popular preparations including mashed refried black beans, thick black bean soup, or “moros y cristianos”, a mix of black beans and rice cooked together on a stovetop whose name refers to the mixing of African and Europeans cultures. “These three ingredients are in 90% of Cuban cooking,” says Douglas. Although sour orange (naranja agria) is seldom seen in the states, it's grown throughout Cuba with trees everywhere from the countryside to street corners. Oregano gives the cuisine a signature spice without adding heat, and garlic is sold in abundance in the form of roped wreaths. The combination of the three spices is referred to as mojo, which is the equivalent of Cuban barbecue sauce and a common addition to any dish. 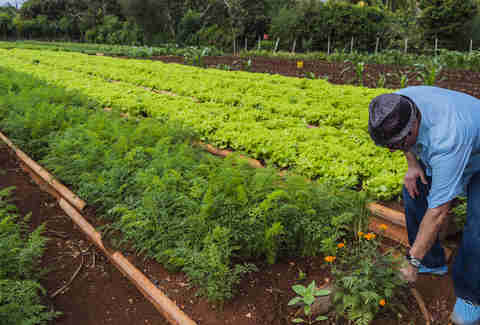 During Cuba's isolation, the lack of fertilizer led them to become an unlikely pioneer of organic farming. 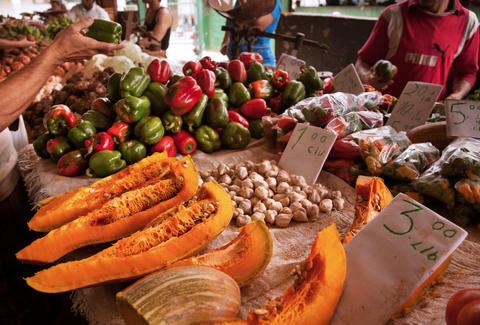 “Cuba has some of the most delicious produce you'll ever have,” says Douglas. Necessity caused farmers to perfect old-world techniques instead of refining chemical crutches, but the downside is a lack of variety. You won't see many greens -- root vegetables like yucca are much more popular, as well as tropical fruits like plantains, mangoes, and grapefruit. 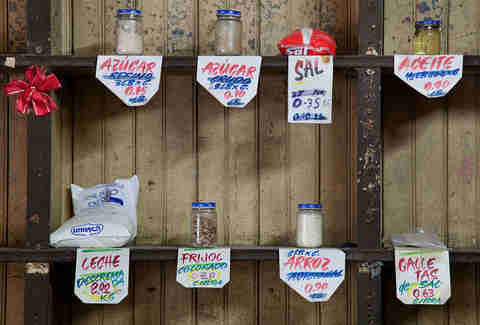 There are nearly 20 different classical Cuban preparations of the grain, but the most common iterations are plain steamed white rice or yellow rice flavored with ground achiote powder. Every Cuban family receives a monthly “libreta,” or a food quota/stamp booklet that's a vestige from the 1960s. These days the libreta only includes staples like rice, legumes, potatoes, bread, eggs, and a small amount of meat, typically of very low quality. Depending on level of wealth, families will subsidize their groceries with black market trade and imports or goods from local farmer's markets. The most popular way you'll see pork served is in simple sandwich form. Depending on the vendor there will be a variety of cuts to choose from ranging from leaner loin to fattier belly, but the real prize is the crispy skin called chicharrones. “The most consistent thing about inconsistency,” says Douglas. In one beachside town he visited, a restaurant overlooking a fishing pier was restricted by the government from serving seafood for fear of creating a black market fish trade, while another beachside restaurant 30km away served only seafood. 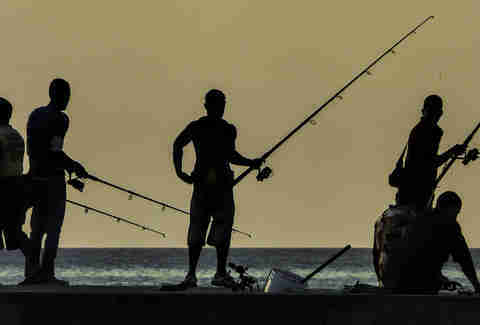 When seafood is available the most commonly seen fish is red snapper (deep-fried whole, sauteed, grilled, or smoked), but diners will also encounter grouper, marlin, spiny lobster, and government-farmed shrimp. When Russia stopped supporting Cuba financially in the '90s it led to an era of scarcity referred to by locals as the Special Period. During this time cattle began disappearing or suspiciously turning up as roadkill, leading the cattle population to dwindle from ten cows per person to one cow per 100. It led the government to enforce fierce penalties for cattle-related crimes. “Killing cattle is more punishable than murder,” says Douglas. The stock that remained was emaciated and sinewy. Imported beef is of equally poor quality because of nebulous sanitary practices along the supply chain. Today the most common preparation of beef is ropa vieja, a slow-cooked stew whose nebulous appearance earned it a name that translates roughly to “old clothes”. 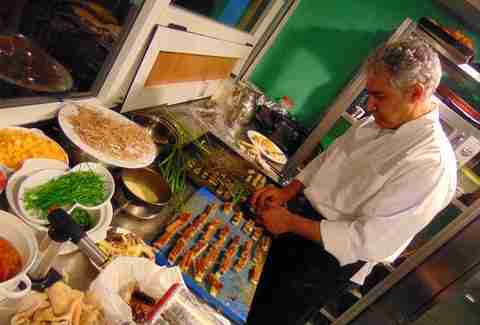 In 2010, the government loosened restrictions on businesses, which paved the way for culinary entrepreneurialism in the form of private restaurants called “paladares." Most of these restaurants are family owned and operated affairs patronized by tourists and wealthier Cubans. Although nascent, the scene is full of passionate restauranteurs serving both heaping mounds of their native foods and more exotic foreign cuisines. Head east of Camaguey into what's referred to as Oriental Cuba, and the cuisine takes on a much stronger creole influence marked by increased use of coconut productions (oil and milk), hearts of palm, and cacao. It devolved quite a bit on the way to school lunchrooms, but the Sloppy Joe sandwich originally dates back to the 1930s at Sloppy Joe's Havana Bar. The proprietor served a sandwich of Cuban picadillo made with ground beef, capers, and olives, which was exported by an American to a Key West bar named the Silver Slipper (eventually renamed Sloppy Joe's) in a sweeter ketchup-driven form without the Cuban ingredients. Visitors to Cuba can still find an OG version today at the Sloppy Joe's Havana Bar, which reopened in 2013 after being closed for nearly 50 years. Dan Gentile is a staff writer at Thrillist. Some of his best friends are Afro-Cuban LPs. Follow him to conga solos for days at @Dannosphere.